Hi there parents! This deal that I hold in my hand is from Mimis Cafe. The reason why I mentioned parents is because, it is the kids who will get a benefit at you next visit at Mimis Cafe. We have here these Mimis Cafe printable coupons which you may apply on your next in-store purchase at Mimis Cafe. 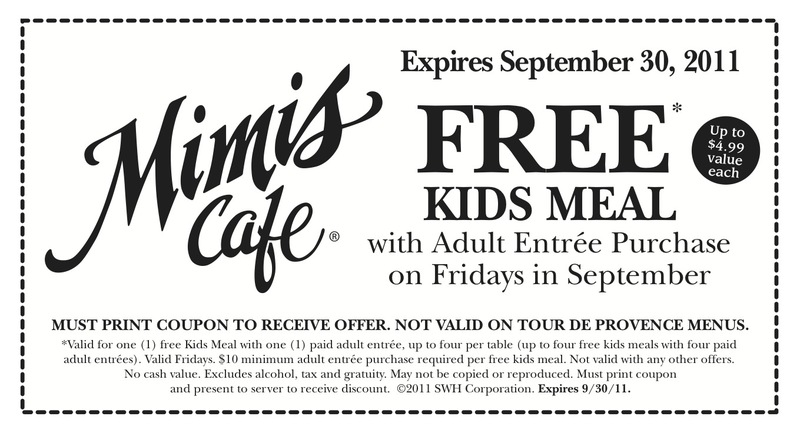 Upon usage of these printable coupons, you will be able to get a free kids meal on your purchase of an entree at Mimis Cafe. Wow! Now that is sure helpful. Do not forget that you will be needing these Mimis Cafe printable coupons on your transaction. These printable coupons are all valid now through September 30, 2011 only. After that date, the deal is no longer good for service.